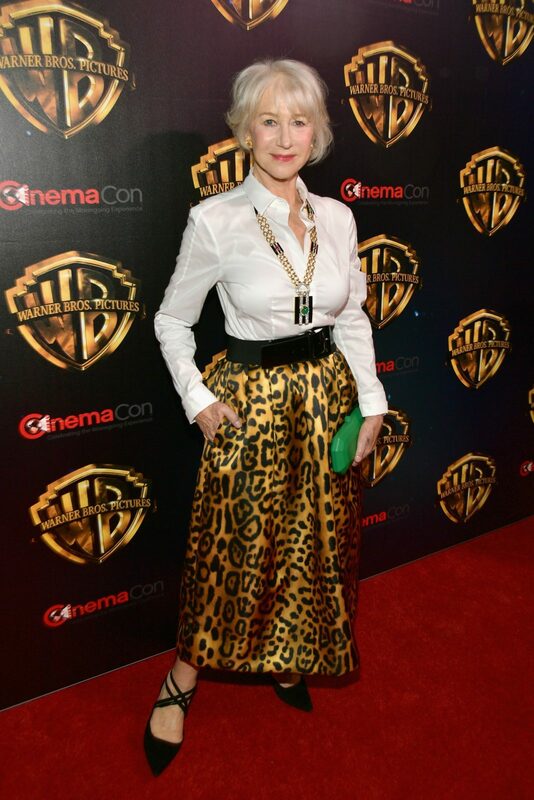 She’s 73 years young and Dame Helen Mirren has proven once again that age is no barrier when it comes to fashion and style. The English actress was all smiles as she stepped out to attend a CinemaCon event in Las Vegas on Tuesday. For the outing, the Woman in Gold exuded glamour in a full-length satin leopard print skirt, complete with a chic crisp white shirt and chunky black belt that she wore around her waist. The star accessorised with a gold statement necklace, and added a pop of colour to her ensemble with a bright green clutch. As she has done for some time, Helen proudly showed off her silver locks in a classy hairstyle. Her appearance in Las Vegas comes just a week after the actress was snapped stepping out in a stunning floral frock for an event in Russia. The 73-year-old glowed in the gorgeous black dress with flowers of red, purple and yellow embroidered all over while posing for photos at the BraVo International Classical Music Awards in Moscow.